When it’s time for Sophie to leave on a big adventure to visit her grandmother in Vancouver, she can’t find her beloved stuffed bear and must leave without him. Bear, however, follows the family and eventually catches up with them at journey’s end. 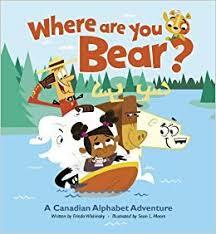 This alphabet book for young readers takes Sophie and her bear on their separate trips from Newfoundland and Labrador to every province and territory in Canada, reuniting them in British Columbia. The words chosen to illustrate the letters of the alphabet have strong connections to regions of the country (e.g., beluga whale for Bb) and are explained in notes on the endpapers alongside a map of Canada. A plane trailing a banner announces the names of the provinces and territories as Sophie and bear cross the country. The thoughtful attention to detail and strong Canadian content make this book useful as part of a Canadian geography unit as well as The Sea Wolves reinforcing the alphabet. Colourful and playful illustrations complete the package. This review is from Canadian Teacher Magazine’s November 2010 issue. Viola Desmond Won’t Be Budged!